A few weeks ago I toured a local nonprofit that offers counseling to women who suffered sexual abuse as children. One of the most memorable parts of the tour was the journaling room—a beautifully decorated space, streaming with light, in which clients can sit after a counseling session and process the experience. In the midst of their struggle to cope with such tremendous pain, they can put pen to paper in a safe, quiet, and comfortable environment. In the writing, they can heal. Seeing that journaling room got me thinking about the power of writing—of words and language and the free flow of thought. I started thinking about how the act of writing helped me deal with issues of poor body image and emotional eating, and about how seeing my words come alive on a page (or computer screen) made me, in turn, feel alive. I thought about the fact that stringing together words and sentences—cramming a blank page with my ideas and thoughts and emotions—has always been my therapy. And then I read about WriteGirl, a nonprofit that uses writing, creativity, and self-expression as an avenue for empowering girls to reach their full potential. The girls receive one-on-one mentoring from women writers and participate in monthly creative writing workshops, all with the goal of giving them the skills and confidence they need to become stronger writers, stronger women, stronger people. “Of course!” I thought. To me, the connection between writing and empowerment has always been an obvious one. Here are some ways the two come together. Through writing we find our unique voices. In a society that tries so hard to make all women look and act the same—same bodies, same clothes, same hair, same ideas—writing becomes a means of breaking out of the cookie-cutter mold and discovering our true selves. Tweet this! Countless times I’ve plopped myself down on the couch to journal, assuming I knew the topic and ideas I would write about. But as the words started flowing, I found myself in a direction—in a world—I wasn’t expecting. The simple act of journaling helped me learn about myself and feel confident in living authenitcally. Talk about empowering! We all have “stuff”—baggage from the past, fears, doubts, anxieties, sadness, insecurities. Too often women are told to keep those things concealed, so we suppress them and stuff them down—sometimes quite literally, perhaps with chocolate. We ignore the “stuff” and put on a happy face and a shiny smile. But of course hiding our stuff isn’t healthy. Writing, then, becomes a safe way of turning inward and uncovering whatever it is that we’ve been concealing so long that we ourselves might not even know is there. 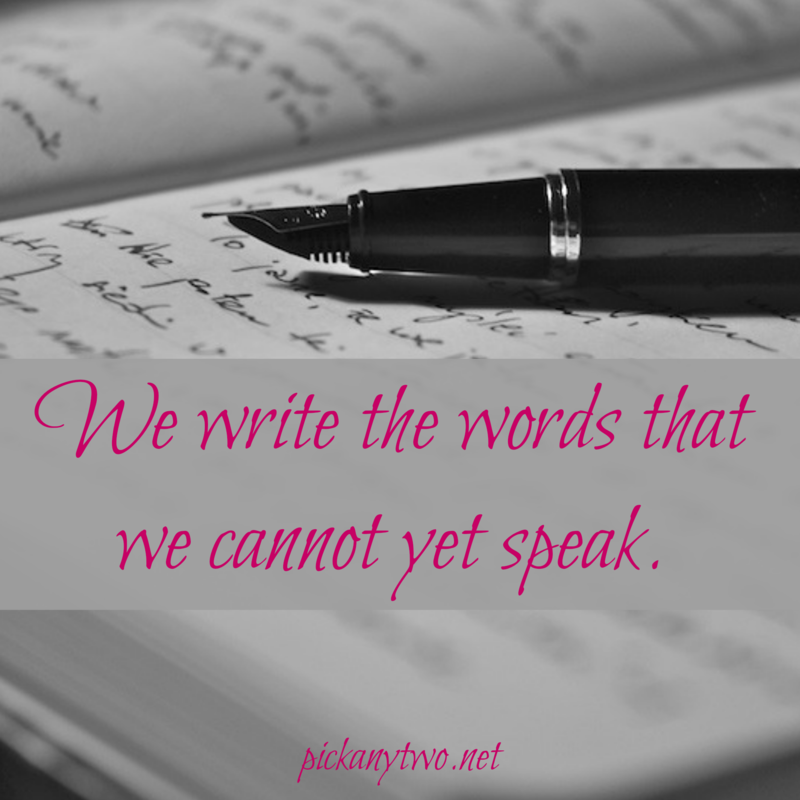 We write the words that we cannot yet speak. We find our true selves as we bleed onto the page. Tweet this! We can choose whether or not to share our words. The beautiful thing about writing in today’s world is that it can span the full range of private to public. You can keep your words locked away for your eyes and heart only; you can share them with select trustworthy friends and family; or you can broadcast them to the world through a book or—even more accessibly— a blog. If you so choose, with just a few clicks your writing can be shared in a supportive virtual space that invites connection and encouragement. And that is a very empowering thing. Do you find writing (or another art form) to be therapeutic? How do you think writing can empower women and girls in our society? Stories have always united people. From sitting around a fire to sitting at a theater together. The greatest gift, beyond love and compassion, is in telling and sharing stories. One must be careful, though, with one’s intent. All stories need to be told with respect and many emotionally charged topics can lead to a potential word free for all. Thank you for sharing this fabulous organization with us! Love all the thoughts & reflections on the many ways writing can help us work through our feelings! I’ve always found writing as a way to really think through the questions and unknowns I couldn’t otherwise process. I started journaling at the age of eight and have kept a journal since then. I think it’s part of my personality and how I communicate with myself: writing my thoughts down is the best way I know how to think. More therapeutic than anything else that I know.. I NEVER know what I’m going to write when I sit down to blog – I kid you not. The twists and turns always surprise me. Thanks for shedding light on this fabulous organization. I wish I had..founded it. I have written music for my entire life up until a few years ago…I poured my HEART out on the keys and sang my soul out in the air…the words were sweet relief and cathartic healing. Yes oh yes…words writing any art really…they are all pathways to health. I do find that writing helps me work through things…even if I never do anything with it. It’s just therapeutic to do it sometimes. I always find writing to be therapeutic. I don’t know what I’d do if I couldn’t write. I love to see nonprofits incorporating writing into their work. I think it can be so freeing for clients. Writing is therapy, art, expression, freedom. Power up with words! do i find writing therapeutic? OOOOOOOOOOOHHHH YEAH.